This collection is specially designed for use with VRayScatter. It includes 12 types of trees and 3 types of bushes. Each one includes 5 different shapes. In addition to those there are 8 standard trees designed for filling huge areas. 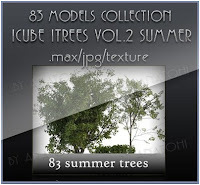 With this 83 model collection you will be able to create realistic – paradise like gardens and forests.